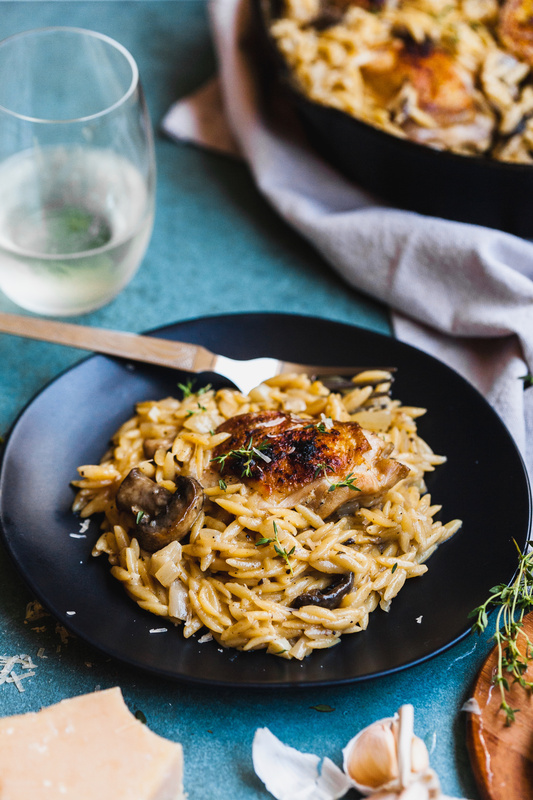 Creamy orzo, perfectly roasted and flavourful chicken - what more could you ask for in a meal? This is my kind of date night food. 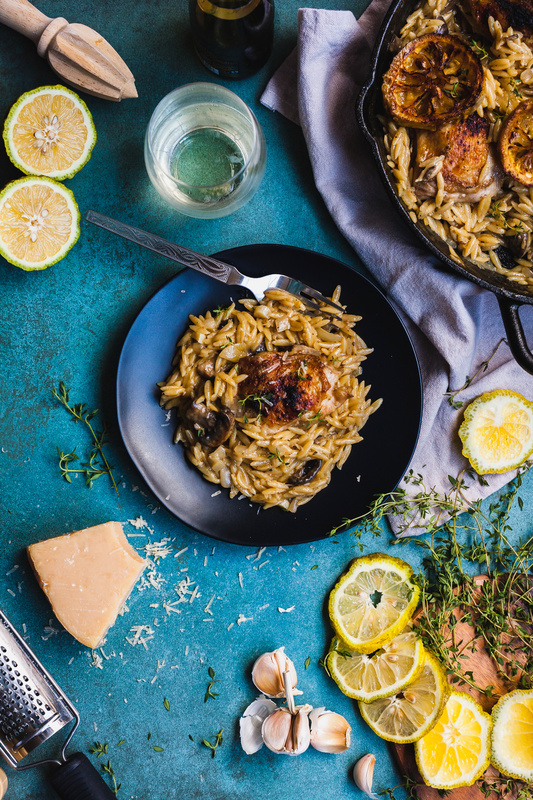 What does date night food mean to me? It means not counting calories, using full cream and eating something decadent that I usually don’t have on the regular. Usually involves cheese and wine as well as some form of carb. One of my favourite date night spots was (it still exists and I cannot wait to return to it when I’m back home) a bustling little Italian restaurant. I loved all the food - the delicious pasta, excellent seafood, great crowd for people watching and great drinks. I would always order a seafood salad, creamy layered pasta dish, lots of vino and share a bite of tiramisu with my date/hubby. The place never disappointed and so glad it’s still around! 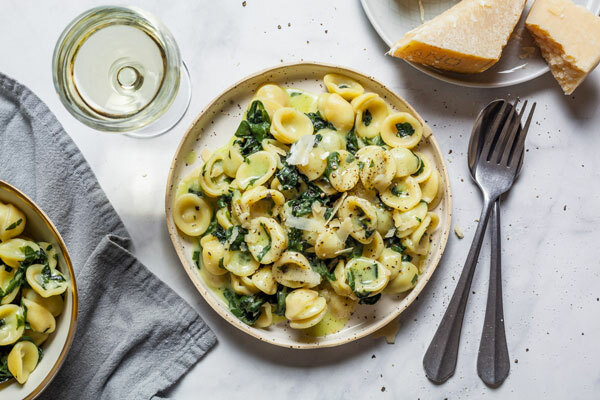 Well, every weekend didn’t include a date night like that, but would usually be a relaxed evening at home cooking something creamy and decadent and watching a movie – equally as enjoyable to someone over 30. 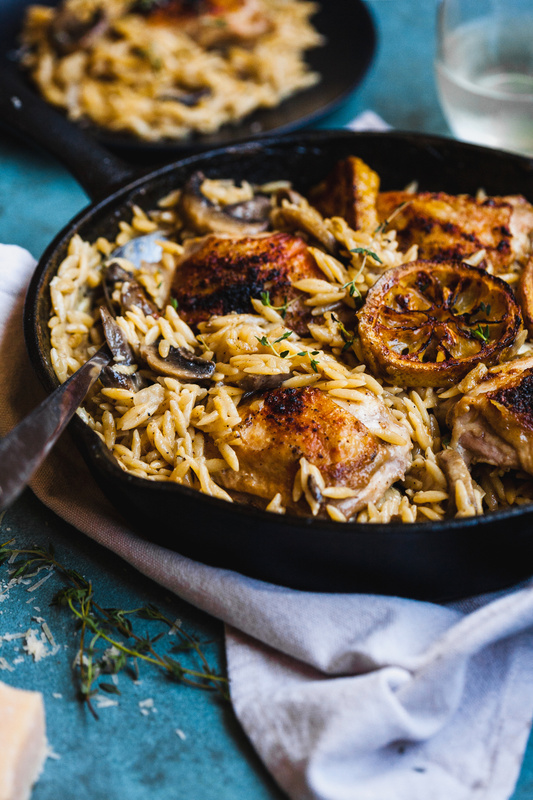 This is one of those kinds of date night meals that is decadent and delicious and is also pretty quick to whip up with minimal cleanup as it’s a one pan meal. 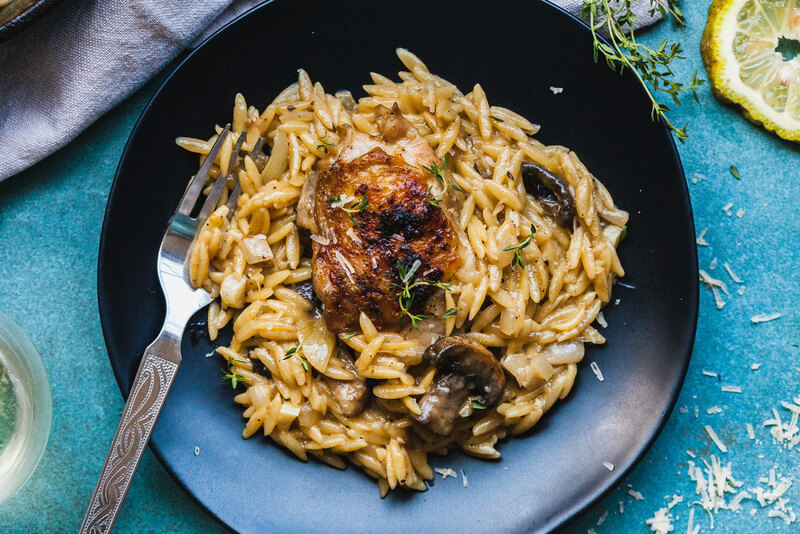 I’m a lover of creamy dishes like risotto and saucy pasta dishes and this recipe combines the two, so I was loving every bite of this dish. Let’s talk about some of the ingredients. 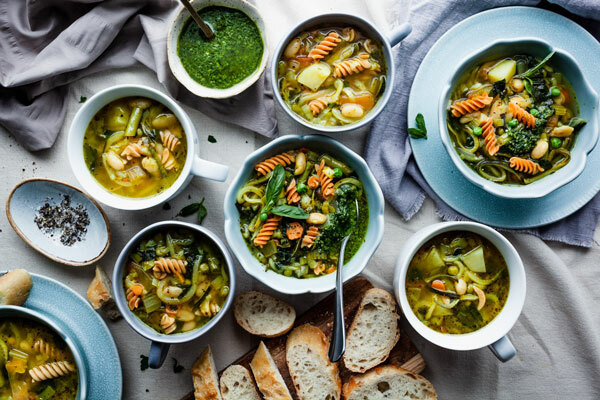 A lighter version of this could easily be made by swapping out the cream for milk or using broth in pace of it. It will lose its riches but will still be delicious and have a lighter flavour. 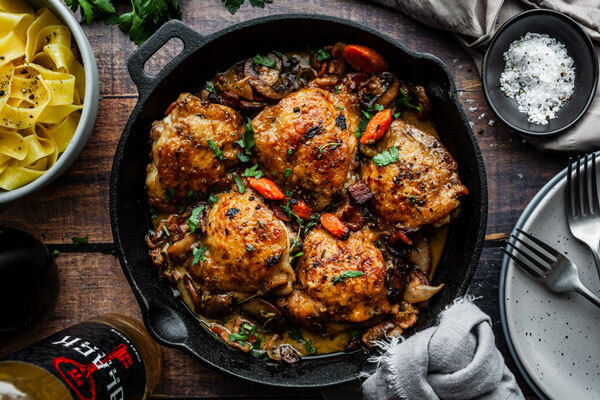 That’s probably a good idea if you’re making this on the regular for a mid week meal. The add ins make the dish even creamier and dreamier so I wouldn’t skimp on these especially if you are going full throttle with the cream. I mean you might as well go the whole hog. Also when it comes to the choice of pasta you can do what you prefer. 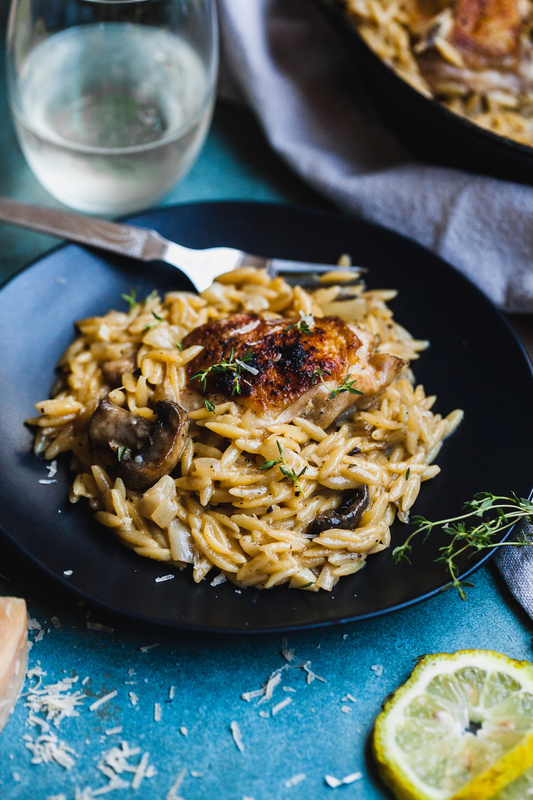 I heard there is gluten free orzo out there so if you would like to use a GF pasta feel free too or another shape pasta that is totally fine. 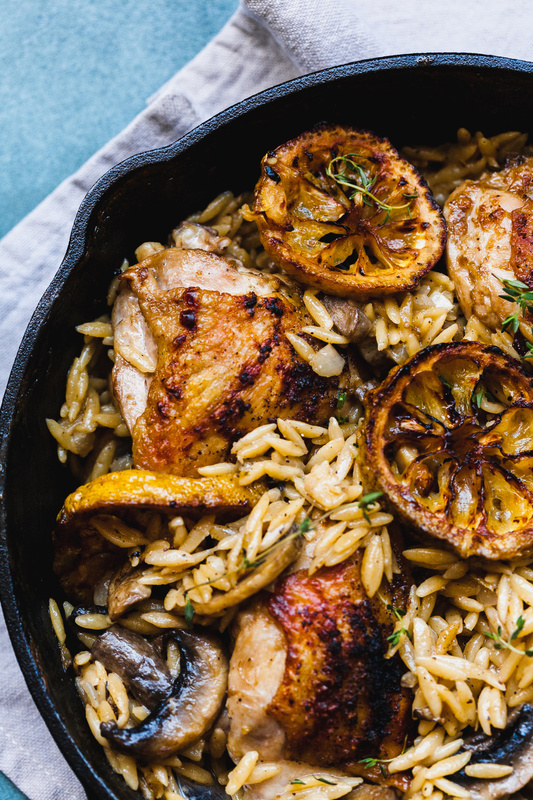 I love orzo and can’t get enough of it and I think it’s perfect in this dish though. Let’s talk lemons! WARNING for all my Trini follower who want to make this dish - definitely use the lemon zest in the dish and feel free to squeeze some fresh lemon juice after as an add in to taste, but do NOT pan fry the lemon slices and roast them along with the dish using our rough skinned lemon variation here in Trinidad. I did this and I normally love bitter and tangy but this was a little much. It didn’t totally ruin the dish for us We still ate and enjoyed it but for those who don’t like that effect, it will spoil your entire dish. If I’m using rough skin lemons with this dish again I will not pan fry and roast. I will just use the zest and juice from it after for the lemony flavour. 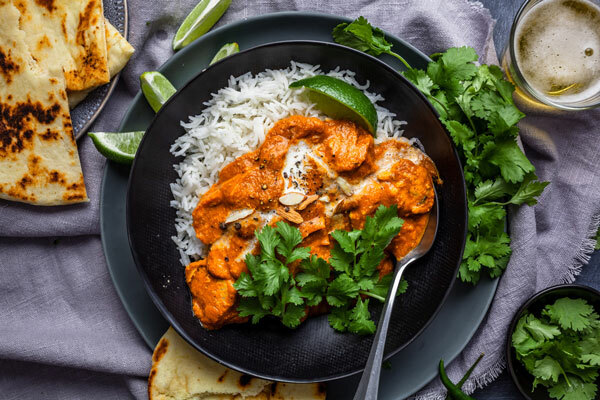 Speaking of flavours, you can also use your choice of fresh herbs and seasonings for the chicken. I used some pretty basic flavours but you can use what you like. That is pretty much all I have to say about this dish. It’s absolutely delicious and the lemon brightens and lightens it up a bit. It helps cut though some of the richness as well. You will love it I’m sure and you can even adjust the veggies to your preference too. I know some of you don’t like mushrooms so definitely try subbing them out for some green peas or any other veggie you might prefer more. Hope you include this gem of a recipe to your date night line up. I was happy I did! Add the remaining tbsp of butter and add the onion and sauté for a minute until softened and then add the garlic, lemon zest, thyme and the orzo. 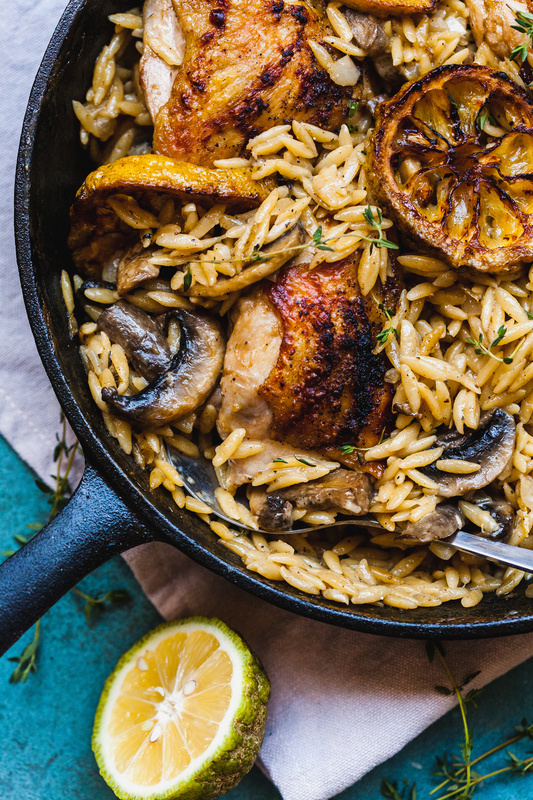 Cook the garlic and toast the orzo for a minute until the garlic and thyme are very fragrant and then add the wine to deglaze the pan (scrape the bottom of pan clean). Carefully remove from the oven, remove the chicken and lemon slices and place on a plate. 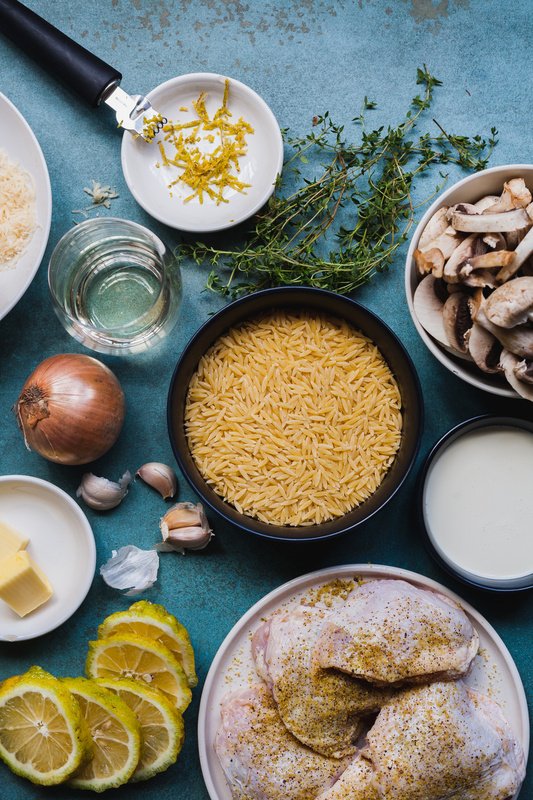 Stir milk/cream and Parmesan cheese into the risotto, season with salt and pepper if needed and serve with the chicken and lemon slices and garnish with fresh thyme or chopped parsley.